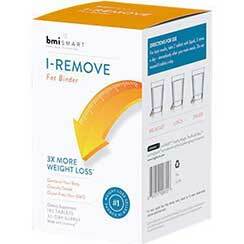 BmiSmart I-Remove is a re-branded version of a popular European fat binding product called XLS-Medical Fat Binder. According to the marketing material, the formulation offers a gentle action that naturally eliminates up to 28% of the fat provided by meals. That’s certainly a benefit worth having, but the formulation will not help the body to burn extra calories by boosting the metabolism. Nor will it directly encourage fat burning. 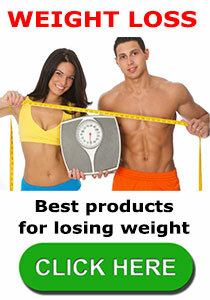 So, although InQpharm state their product is the “best weight loss seller in Europe” we doubt this is really the case. Each (2 tablet) dose provides 1000mg of Litramine Proprietary Complex. There are no other active ingredients. How to Use – Customers are advised to take the tablets within an hour of finishing a meal. The recommended dose is two tablets and three doses are required each day (taken with liquid). The manufacturer states it’s important to drink at least eight glasses of water each day and suggests a minimum treatment period of 30 days. The Litramine Proprietary Complex contains a combination of cactus powder (Opuntia ficus-indica) and gum arabic. The ratio is not provided. 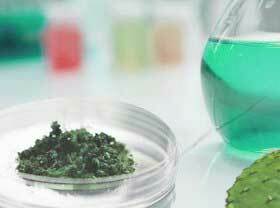 The latter ingredient is unlikely to serve any active role, but research shows opuntia ficus-indica cactus extract can be effective for blocking fat digestion so, presuming it is not overly diluted with gum arabic, Litramine should have the potential to reduce the amount of fat the body is capable of digesting. A gram of fat is good for nine calories, so there is no denying fat binders have a role to play in weight loss. The problem is they rarely work well as a key player. Experts state the best diet pills are the ones that offer multiple benefits. BmiSmart I-Remove is incapable of doing this and, although the claim that it provides appetite suppression may be partially true, it’s hunger curbing ability is likely to be minimal. Fat binders block fat absorption because the active ingredient absorbs fat and stops the digestive enzymes from acting upon it. The presence of the compound formed by Litramine and the fat it’s bound may help create some degree of satiety, but it’s a secondary benefit, so the hunger controlling ability of BmiSmart I-Remove will be a poor match for the ability of good appetite suppressing ingredients like capsicum extract and African mango. BmiSmart I-Remove should not be used during pregnancy or by women who are breastfeeding a child. People who have existing health conditions are advised to obtain the necessary medical clearance before using this or any other brand of dietary supplement. Products of this nature do not have a reputation for producing side effects, but people who use fat blockers should always try to limit their dietary fat intake. Consuming too much fatty food will give the product more fat to block and this will increase the likelihood of stomach upsets and/or diarrhoea. Expect to pay around $60 for a 30-day supply. BmiSmart I-Remove is product that is capable of supporting weight loss, but it has such limited abilities it’s unlikely to become a top seller in the United States and, despite the manufacturer’s claims to the contrary, we doubt it’s the #1 product in Europe. We can think of a number of products that have more to offer in the way of benefits and all of them are sold with a money back guarantee. We are not saying BmiSmart I-Remove/XLS-Medical Fat Binder is a dead loss, but we suggest you take a look at some of the products that gained our approval before rushing off and ordering something that has such a limited potential. As a fat stopping product we rate PhenQ over and above BmiSmart. 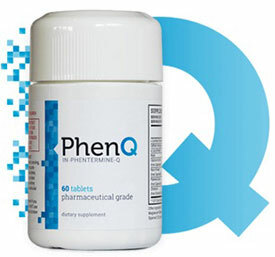 PhenQ can block fat and also burn existing fat deposits and suppress appetite. PhenQ is available from it’s own official website where a long 60 day money back guarantee is given on all purchases. This entry was posted in Fat Binders and tagged BmiSmart I-Remove Canada, BmiSmart I-Remove CVS, BmiSmart I-Remove Negatives, BmiSmart I-Remove or XLS, BmiSmart I-Remove Results, BmiSmart I-Remove WalMart, Litramine Canada by admin. Bookmark the permalink.